The McCune Collection of Rare Books & Art is the legacy of longtime Vallejo resident and physician, Dr. Donovan McCune, who was born and raised in Ohio. After graduating from Georgetown University, he obtained his medical degree from Johns Hopkins. Dr. McCune’s professional career spanned numerous positions as a pediatrician in New York, New Jersey, Ohio and Connecticut. In 1951, he moved to California to work for Kaiser Permanente Hospital in Vallejo, where he served as Chief	of Pediatrics and also staff assistant to the Executive Director of the Kaiser Permanente Group. Dr. McCune had four passions in life: public speaking, the study of Latin, a love of books, and a compelling interest in how books were produced. These passions are reflected in the items that Dr. McCune collected. He collected books on California history, Latin, the printing arts (e.g. 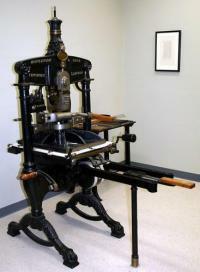 typography, printing, book design, and binding) and fine printing by notable private presses. He purchased an Albion Hand Press (manufactured in London in 1852) so that he could try his hand at fine printing. Additionally	, he both gave and attended lectures on book making and the printing process. Dr. McCune was appointed to the Vallejo Library Advisory Board (VLAB) in 1961, serving on it for two five-year terms. In 1967, during his second term on the Board, he began to donate portions of his collection to the City of Vallejo. These donations continued throughout his second term and were graciously accepted by Vallejo through its City Council. In 1969 a room expressly designed to house the collection in the John F. Kennedy Library was named for Dr. Donovan J. McCune. Several months aft	er the library officially opened in 1970, Dr. McCune had a stroke which affected him until his death in 1976. As Dr. McCune left no funds to maintain the collection, the City of Vallejo was tasked with finding a way to provide for its preservation. Consequently, a portion of the collection was auctioned in 1986 to establish a McCune Endowment Fund to maintain the collection. Interest from this fund is exclusively used for the operating expenses of the collection. In 1987 the City of Vallejo amended its municipal code in order to form the McCune Endowment Committee (i.e. McCune Committee). The committee is charged with maintaining, protecting, and enhancing the collection as well as making it available to the public. To review and make recommendations to the Vallejo Library Advisory Board concerning expenditures to be made annually with funds from the McCune Endowment Fund. To solicit contributions to The McCune from members of the community. To make recommendations concerning display, use and maintenance of the Collection. To explore the possibilities of forming a local printing club to use the Albion Press. To make annual reports to the Vallejo Library Advisory Board on the financial status of the McCune Endowment Fund and the activities of the Committee. Enrich the culture of our community. 2015 has been a year of both significant challenges as well as exciting new opportunities for The McCune Collection. The seven-member McCune Committee along with our affiliate members and volunteers have succeeded in raising the profile of The McCune by expanding the activities and programs we offer in addition to making several capital improvements. Furthermore, we are all the more proud to have realized these accomplishments despite diminished returns on the Collection’s primary source of financial support, the McCune Endowment Fund, as interest rates remained near historical lows. The committee successfully reduced reliance on the Endowment Fund through a combination of economizing on key budget items and introducing new donation sources. Budget item economies included: reducing security costs nearly 40% by obtaining Vallejo City rates; cutting advertising costs 50% by bringing printing in-house with a donated color laser printer; and combining phone with internet service which also gave The McCune its own WiFi access. New sources of donations included: featuring a used book table at most McCune functions; hosting Chaucer performances by the Magical Moonshine Theatre; and holding new fund raising events like the 2015 Holiday Tea. The combined effect of these efforts enabled the Committee to reduce this year’s Endowment Fund allocation to $2,500 from $4000 last year while simultaneously expanding activities and making improvements. A key factor in continuing to sustain The McCune with minimal annual Fund allocations will be the Committee’s pl	ans to reinvigorate supporter donations through a new McCune Patronage Program in 2016. The McCune attracted over a thousand visitors in 2015. This significant increase over previous years is due not only to a successful Spring and Fall Program Series, but several new activities which are helping to raise the profile of the McCune Collection. Since April of 2015 The McCune has become a regular venue in Vallejo’s 2nd Friday Art Walk by hosting exhibits by local artists. Participation in the 2nd Friday Art Walks marks the first-ever public evening hours for The McCune, and has helped to make the Collection accessible to a whole new demographic. The McCune Room continues to be used as a meeting location for an increasing number of local groups. In addition to groups like the Friends of the Vallejo Public Library or Sister Cities, the Vallejo Art Alliance and the Vallejo General Plan Working Group are also now meeting in The McCune. Another development helping to raise the profile of The McCune has been the creation of a Wikipedia page devoted to Dr Donovan McCune. Beyond expanding the activities and programs offered by The McCune, the Committee is also pleased to have achieved a number of capital improvements. Enhancements to The McCune include: replacing several noisy fluorescent light ballasts; having the carpet professionally cleaned; replacing the compact refrigerator with a larger one; acquiring a microwave oven; and acquiring a donated third Windows computer. Several enhancements have also been made to the McCune Collection website to optimize viewingit on mobile devices. In the wake of the unfortunate loss of some art work belonging to JeanCherie while on display in the foyer outside the McCune Room, the Committee has re-scrutinized security measures and taken a number of steps including: having the existing alarm checked; replacing the backup battery for the alarm; developing a protocol for activating the foyer motion detectors; and examining options for installing video surveillance. Finally, during 2015 the Collection has been augmented by the donation of more than 40 books, photos and art prints. The Committee has also embarked upon an ongoing comprehensive effort to standardize its policies and procedures including drafting and/or revising such documents as: the McCune Committee Orientation Handbook; the McCune Committee Bylaws; the McCune Collection Acquisition Policy; and the McCune Committee Membership Policy. The McCune Collection is fortunate to be overseen and operated by a multi-talented Committee supported by equally talented affiliates and volunteers, all of whom devoted over 1700 hours of their time in 2015. By continuing to attract and enlarge a diverse volunteer base as well as the range and support of donors, the Committee is confident that The McCune’s status as a cultural gem of Vallejo remains secure and continues to enhance the quality of life for all residents of Vallejo and surrounding communities. March 15. History as Absurd Horror: Why I Destroy Books. Guy Brookshire. April 19. History of the Mare Island Naval Shipyard. Lewis Halloran. May 17. Exploring the World of Printmaking. Linda Ardakani. Sept. 20. Riding Wild Horses. James Orlando. Oct. 18. The California Digital Archive Newspaper Project. Dr. Henry Snyder. Nov. 15. Maritime Adventures Around-the-World: 1930's cruise journal of Midshipman Perry Duncan. Larry Stevens. “High Tea” Supporter Appreciation Event. Magical Moonshine Theatre Chaucer Performances. Reception for Vallejo’s Poet Laureate Genea Brice. The Visions of the Wild children’s Art Collection Display. McCune Tour for Senior Access Adult Daycare Service in San Rafael. The website was redesigned to make it easier to view on a mobile device. A large part of the development process for the mobile site involved going through all the existing pages and standardizing their layout. This resulted in all pages and image galleries having a more consistent look and feel and the color of the links were brightened to make them more visible. A twelve-month calendar has been added to list the events taking place at The McCune and a drop-down menu to make it easier to review the categories of items in the collection. How to Identify Prints. Bamber Gascoigne. Thames and Hudson. The McCune Endowment Fund was created in 1986 by the City of Vallejo through auctioning some of the Collection’s assets. Under CA State law and Vallejo’s Municipal Code, this fund is managed by the Finance Director of the City of Vallejo. A portion of the interest generated by the fund is allocated each year to the McCune Committee’s operating budget. The McCune Endowment Fund had a value of $111,142.38 in the beginning of 2015. The Fund earned $897 with interest rates remaining near historical lows. Thus after disbursing $2500 of income to the McCune’s operating budget, there is now a balance of $109,539.38 in the Fund. Since the Endowment Fund is a major source of support for the operation of the Collection, the goal has been to ensure that the Endowment Fund retains a net balance sufficient to maintain an inflation-adjusted value which either remains steady or grows a bit. That way, future interest income will at least not be further eroded by the rate of inflation. Joan McCann as Treasurer of the McCune Committee provides Fund Reports and Commentary to the Committee. Founded in 2006, the McCune Art and Books Collection Foundation serves as a 501c(3) non-profit source of funding for the McCune Collection. During 2015, the Foundation received $1448 in contributions, the largest of which were $250 from the ChameleonJohn company and $165 from Katy Miessner of Vallejo, CA. An additional $420 was received through book table donations, $355 from event donations (primarily the Program Series and the February High Tea) and $258 through its fiscal sponsorship with the Magical Moonshine Theatre. The Foundation also played a significant role in underwriting startup costs for the McCune’s newest venture as a 2nd Friday Art Walk venue. The Treasurer of the Foundation provides Financial Reports and Commentary to both the McCune Foundation and the McCune Committee.